In life, there are some experiences that others can try to relate to and genuinely feel sympathy and compassion for but never truly understand unless they’ve lived those experiences themselves. Being undocumented in the land of the free and home of the brave is one of those experiences and marks you forever. For twelve years, I felt like I was living in midair—I considered myself American, but my feet could never touch the ground because the government I so admired didn’t consider me one of its own. Although by textbook definition I am no longer a Dreamer, I will forever call myself one—because Dreamers are a family who relate to each other by the similarity of their scars. We’ve all been marked by the fear that our parents may not come home for dinner, falling victims to the raids. But there is one scar that stands out in all of us: the fear of not being able to attend college. This fear is all too real because undocumented students cannot apply for federal financial aid (including loans) and are ineligible for instate tuition in most states. Furthermore, they are barred from applying to countless scholarships which require citizenship. And the scholarships that are available to Dreamers typically come in small amounts. These factors, along with the socio-economic realities of the immigrant community, make it nearly impossible for undocumented students to enroll in a four-year college program, much less at the institution of their choice. Until my senior year of high school, the odds were against my attending college. In my entire life, I have never feared anything more. My parents always painted a picture in my mind of what higher education could mean for me and my future. I yearned to know what it would feel like to move into a dorm room, sit in a large college lecture hall, and graduate as my parents cry tears of joy from the audience. The agony I felt over the thought of never getting the opportunity to experience these things is something that only undocumented youths and their parents can truly understand. 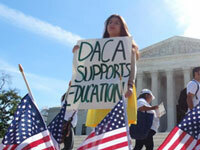 Although the DACA program made it possible for many undocumented youths to experience college, they still cannot walk with their feet firmly planted on the ground because not only is DACA temporary, but based on this administration’s actions on immigration, it will likely to be taken away. Legislators have for a long time failed to heal this community, but justice is just a bill away. Different versions of the Dream Act have existed since 2001, and fundamental portions remain, but the Dream Act of 2017 offers unprecedented features. The greatest differences are that it expands eligibility to those who entered the United States before the age of 18 and allows DACA recipients to automatically receive Conditional Permanent Resident Status. Also, the Dream Act of 2017 would repeal part of the Illegal Immigration Reform, and Immigrant Responsibility Act of 1996, which dissuades states from offering instate tuition privileges to undocumented individuals. These variations may appear minor, but they are grand concessions for the thousands gaining new opportunities. Some people may tell you that the Dream Act will allow undocumented youths to “cut in line.” Our immigration system is not as simple at that, and neither is this proposal. Upon meeting the eligibility requirements, the applicant is granted Conditional Permanent Resident (CPR) status. This is an element of the Dream Act that many Americans are unaware of as it is not as well communicated. After eight years with CPR status, the applicant must have completed two years of schooling at an institution of higher education, have served in the military, or have been employed for three years to be awarded Lawful Permanent Resident (LPR) status. This step opens the doors to citizenship. For these reasons, lawmakers often say that the Dream Act creates “a path to citizenship” because it would take many years, processes, and fees to obtain. The Dream Act is neither an amnesty nor an invitation for more illegal immigration; it is a chance for youths who are American in every way except on paper to be welcomed home, where they belong. If passed, it would give the nearly 800,000 DACA recipients and thousands more undocumented non-DACA the opportunity to know what it feels like to move into a dorm room, sit in a big lecture hall, and graduate. Gaining a higher education previously unavailable to many would give them the opportunity to become anything and everything they’ve ever dreamed, like the doctor who finds the cure to Alzheimer’s disease, the scientist who finds innovative ways to scale back the consequences of global warming, or in my case, the future United States Attorney General. Take action today! Urge Congress to pass the Dream Act on Connecting Our World. As a Public Policy major and NAFSA’s public policy intern this summer, I am proud to have worked for an organization that actively advocates for the timely passing of this bill. NAFSA believes in legislation that promotes national and global advancement through education, and this bill will allow Dreamers to contribute their talent across many institutions. It's time that as Americans, we embrace the Dream Act of 2017 for the benefit of our fellow Americans and the academic and financial advancement of the nation. In life, we all have a list of things we aspire to do before parting. Perhaps it's to meet an influential person or travel to a landmark. At the top of my list is something I cannot achieve on my own: I want to live to see the day in which the Dream Act is signed into law. On that day, I will go to Capitol Hill and find my Dreamer family, usually recognizable by their scars, but now by their indescribable joy. Together, we will plant our feet firmly on the ground and shout victory, victoria! Lina Maria Lenis Gonzalez is a rising third year student at the University of Virginia, studying public policy and leadership. She interned with NAFSA’s public policy department in the summer of 2017. She is most passionate about education and immigration issues and plans to pursue a law degree.